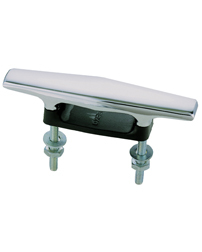 Boatersland Marine > Anchor/Docking > Cleats > Perko Cleats > Perko 1316001CHR Open Base Cleat - 4-1/2"
Perko 1316001CHR Open Base Cleat - 4-1/2"
Chrome plated zinc, plastic base. Stainless steel studs, nuts and washers. Maximum Rope Size - 3/8"
Stud - 12-24" x 1-1/2"